New stadium, same Novak Djokovic. World no.1 began his quest for a seventh title at the Miami Open presented by Itau on Friday night with a 7-6 (2), 6-2 victory over ATP no.81 Bernard Tomic. 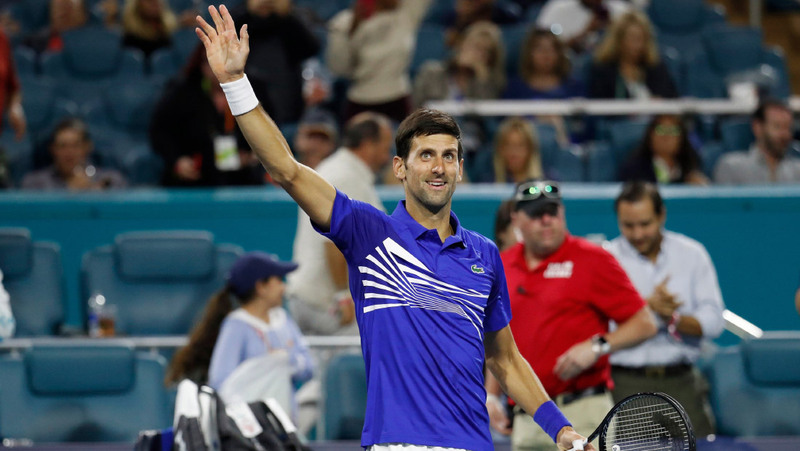 The Serbian star needed just 73 minutes to seal his first win at Hard Rock Stadium, the new home of the Miami Masters, and move past the Australian into Round 3. Tomic broke first, but Nole broke back immediately to level at 3-all and went on to clinch a tie-breaker 7-2. The second set was one-way traffic, as Novak broke twice, in the first and seventh games, for his sixth triumph in as many meetings with Tomic. Match statistics: aces (11-9), double faults (3-4), winners (23-23), unforced errors (14-32), total points won (69-53). Djokovic will next face Federico Delbonis who beat no.32 seed John Millman (AUS). It will be the first career meeting between Novak and the Argentine.